This Avant garde one level design on 120 feet prime no bank Lake Washington Waterfront home is available for purchase in Mercer Island. The home is currently listed at $7,295,000. Completely remodeled, but the original International Style design was incorporated in the remodel. This luxurious Mercer Island home features an incredible kitchen, family room, media room, office, pantry, floor to ceiling windows and has an open floor plan. The sweeping lawn to beach and 55ft +/- dock with beach house is perfect for entertaining or just enjoying the sun. Click the link to see more details about this beautiful home. 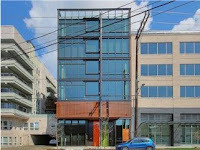 Tuesday, I toured two amazing live/work spaces at the Art Stable in Lake Union, at 516 Yale Avenue N. Since its construction, the Art Stable in Lake Union has received multiple awards including the 2011 AIA Housing Award, and was named 2011 Project of the Year by Residential Architect Magazine. The 6-unit building was designed by Tom Kundig of Olson Kundig Architects, and all units came on the market for sale in 2010 as empty shells, allowing buyers to create their own unique space. The Art Stable is built on a site that was formerly a horse stable, hence the name. Of the 6 units in Art Stable, only two remain. The units, #400 and #600, are incredible spaces that can be transformed in so many ways. 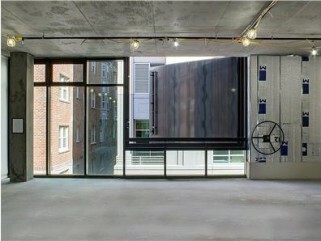 They have floor to ceiling windows and large, industrial style metal “art windows” on the alley-side. These “art windows” (and multiple others) are hand-crank operated. The art window is referred to as a “gizmo”, a hand-operated device that literally moves a part of the building. Gizmos can be found in much of Kundig’s architecture. The purpose of the window, in coordination with the crane atop the roof, is to provide a space through which artists can bring their pieces into their units. Another cool feature is the geothermal heating and cooling systems in the building, which are very energy efficient. This is a more advanced system that hasn’t been used much in the U.S. As far as finishing the units, buyers can expect to pay at least $150/sf, depending on materials used.